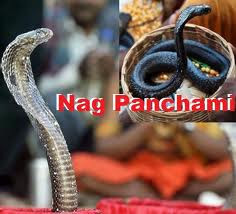 The festival of Nag/Naag Panchami is dedicated to the worship of snakes Pooja. 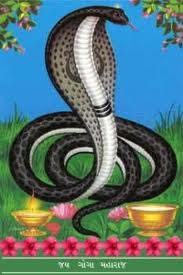 It is celebrated all across India at the peak of the monsoon- the time when snakes are most likely to be around- and takes the form of prayers to the snake god for protection from snakebite. Specific pujas differ from one part of the country to another; in some places, live snakes are worshipped; in others, an image or a dough effigy of a snake is revered. The worship generally includes bathing a snake (or its idol) with milk, to the accompaniment of the music played by a snake charmer. Needless to say this is one day when snake charmers are in great demand! 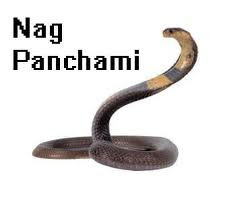 Nag Panchami is also connected with the following legend of Krishna. Young Krishna was playing with the other cowboys, when suddenly the ball got entangled in the high branch of a tree. Krishna volunteered to climb the tree and fetch the ball. 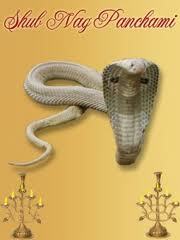 But below the tree there was a deep part of the river Yamuna, in which the terrible snake Kaliya was living. Everybody was afraid of that part of the river.Suddenly Krishna fell from the tree into the water. Then that terrible snake came up. 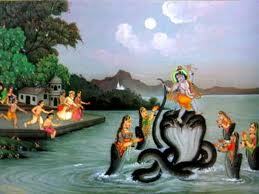 But Krishna was ready and jumping on the snake’s head he caught it by the neck. Kaliya understood that Krishna was not an ordinary boy, and that it would not be easy to overcome him. So Kaliya pleaded with Krishna: “Please, do not kill me.” Krishna full of compassion asked the snake to promise that henceforth he would not harass anybody. Then he let the snake go free into the river again. 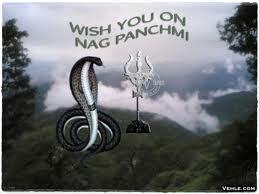 On Nag Panchami day the victory of Krishna over the Kaliya snake is commemorated. For this reason Krishna is known as “Kaliya Mardan”. 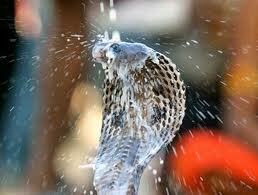 Snakes are believed to like milk. As this is the day of the serpents, devotees pour milk into all the holes in the ground around the house or near the temple to propitiate them. Sometimes, a small pot of milk with some flowers is placed near the holes so that the snakes may drink it. 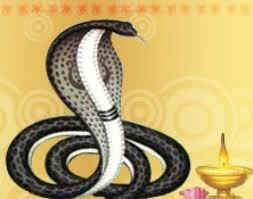 If a snake actually drinks the milk, it is considered to be extremely lucky for the devotee. The festival is celebrated with much enthusiasm by all, especially women. As most rivers in India are in spate during the month of Shriven, poisonous snakes come out of their subterranean abodes and creep about in plenty all over the place. Many also float on flooded rivers running through the countryside. Mortality from snakebites must have been considerable to prompt people to worship the nagas to seek protection from them. Because of the fear, nagas were elevated to a divine status by the Hindus. 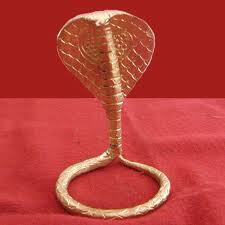 The serpents are believed to have the capability to change their shape at will. When in human form, they are depicted as beautiful women and handsome men.